“We have heard about what happens when floods hit developed countries, they quickly rebuild and life continues. 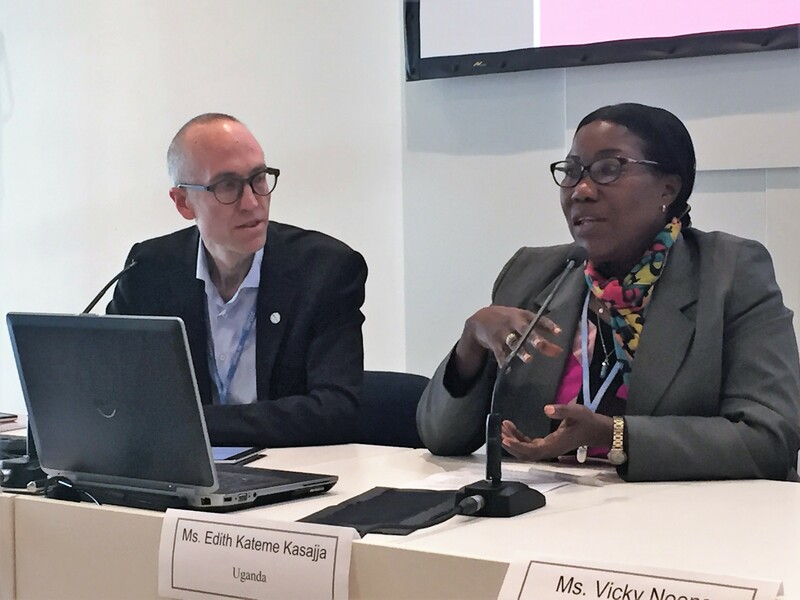 But when floods hit in countries like Uganda as is happening right now, you can’t imagine how long it takes for us to get things back to normal,” said Edith Kateme-Kasajja, climate finance negotiator from Uganda and negotiator of the Least Developed Country Group during the ACT Alliance side event at the Climate Conference in Bonn. “We are calling on our colleagues and development partners to ensure that countries that are resource constraint and vulnerable to climate change are given the priority to access climate finance,” she continued. Kateme-Kasajja’s call shed light on the challenges and concerns of many developing countries to access climate finance in order to respond to the negative impacts of climate change. 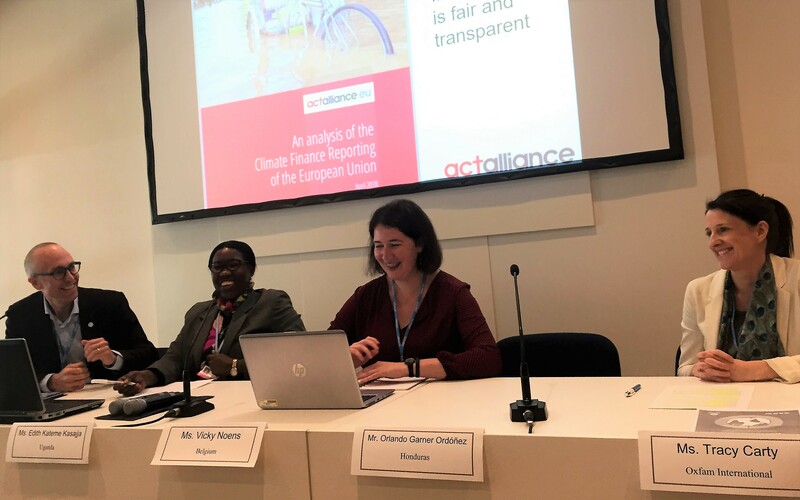 The side event was co-hosted by ACT Alliance, along with the Danish 92-Group, a coalition of Danish NGO’s working on environmental and development issues. The purpose of the side event Counting Climate Finance that is Fair and Transparent, was to explore and to discuss the accounting, transparency and accessibility of climate finance which has become a central theme in the climate negotiations in the lead up to the 24th Conference of the Parties (COP24) to be held in Katowice, Poland later this year. The side event also aimed to encourage discussion on the various opinions on what should comprise climate finance from the perspectives of CSOs and governments. A range of organizations and representatives participated, including Vicky Noens of the Government of Flanders- Belgium, Edith Kateme-Kasajja of the Government of Uganda, Tracy Carty of Oxfam International, and Mattias Söderberg of ACT Alliance member DanChurchAid. Climate finance is an essential form of support for particularly vulnerable countries to be able to make progress on sustainable development. In Paris, at COP21, countries agreed to mobilise at least 100 billion (bn) USD per year in the form of climate finance from the year 2020 onward. This finance is intended to provide support to countries that do not have the capacity to adequately respond to climate change. Mobilizing the 100bn USD as committed to by parties, and developing clear rules, guidelines and modalities to do so will be important in order to safeguard trust and political goodwill between parties, which is key to any multilateral process. “This year parties are expected to finally agree on accounting standards for climate finance that will govern what gets reported against the 100bn USD commitment. It is critical that the rules are developed and that we build confidence that the 100bn is being met in a fair and transparent way,” said Tracy Carty of Oxfam International. Mattias Söderberg of ACT member DanChurchAid presented research from ACT Alliance EU’s Analysis of Climate Finance Reporting of the European Union. According to the report, climate finance from EU institutions and EU Member States has increased significantly from EUR 9.5 bn in 2013 to EUR 20.2 bn in 2016. “While we appreciate that there has been an increased attention to adaptation, we need to consider the balance between adaptation and mitigation,” said Söderberg. “A little over 30% of climate finance has gone to adaptation, and this is not what we call a balance,” he continued. In the context of climate change, adaptation refers to the wide range of actions taken to reduce or prevent the damage or potential damage that could be caused by the impacts of climate change. For this reason, adaptation is of utmost importance for many developing countries. Mitigation refers to the actions taken to reduce the potential of global warming, by reducing the level of greenhouse gases in the atmosphere. Enabling environments refer to conditions including legal, organisational, informational, political, cultural, and others, that might affect the ability of an institution to efficiently use or allocate the support it receives. Despite a clear call from many developing countries on the need to balance support available for adaptation with that available for mitigation, Noens stated that approximately 95% of the voluntary contributions to the Adaptation Fund have been provided by the EU and member states. While the balance between the support for adaptation and mitigation has been a contentious point between parties in the negotiations for many years, another concern shared by developing countries is their access to climate finance. The ACT Alliance EU Report identifies that most of the climate finance from the EU goes primarily to middle income countries, with Turkey having received a large amount of EU funds, “Turkey alone receives more funds than all of the least developed countries together,” said Söderberg. 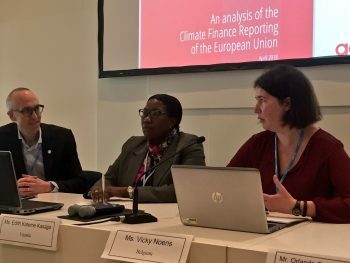 The discussions at the side event explored the current status of the climate finance discussions and identified some of the current challenges that Parties will need to continue to work on to overcome. ACT Alliance firmly believes that climate finance must be fair, accessible and transparent to ensure that trust can be maintained between countries, so that those who face the greatest of climate change burdens are appropriately supported.